Well October is gone! What did I do? Attended my companies' 35th anniversary, received my motorbike, sold my bosses car and had a Kiwi Halloween. Attended the 35th Anniversary of Octa Associates in Auckland (50 staff plus partners). It was a good time and very good to meet the rest of the company that is seeded in 4 major cities in NZ. The company picked up the first night in a great hotel, an incredible dinner at the War Museum atop one of the major parks in Auckland and an amazing breakfast on Saturday. The Museum dinner was a make shift restaurant right in the middle of the beautiful lobby that never serves food. After the museum some of us went to town to represent. The first bar was a bit slow so we we decided to leave and as we were walking out the door in came 3 directors and drunken Howard. I was beside myself that A) they found us and B) it was after 12 am when they joined up and one of them was still going when I left at 3:30am. Could this be the right company for me? On Saturday I got to have drinks with Brad Senior and Tracy who I hadn't seen in a while. I finally found some good bars in Auckland although it did remind me of Canada a bit too much (lots of money throw around on looks). Terry (Future head of family) and Ben (Irish handcuffed) in front. My baby came to town. Well Akira arrived in good shape after only 1 month (Sept. 28 to Oct. 22, Van to Welly). It was great to finally get it out of the box and everything else I had shipped with it. Hockey stuff, golf stuff, tools and in soles which I'm loving. Sure you can get everything in NZ, sort of, but the stuff from home is the best and it's much cheaper. Thanks to Ben and Gavin for the hand. I couldn't have done it without you! The brothers sharing the garage at work. Morning Star (1998 Honda VFR)and Akira (2001 Honda VFR). Which one do you like better? As a parent I like them both equally! Brad the Used car salesman. As most of you know I'm a pretty good wheeler and dealer when it comes to selling cars and motorbikes. Probably all kinds of crap if I have the time. Anyhow, when I returned to NZ and got back to the office in Sept. I went in the garage to ensure I had parking for my motorcycles. To my surprise I saw one of my bosses' 328 CI sitting there had been in there since I left. He now has a shining new one (530?). Even though there was lots of room for my bikes and the old BMW, the poor communal company car was left in the rain. Since no one else in the company is a wheeler and dealer like the "kid" I decided to sell it on the Kiwi version of Ebay = Trademe. I thought it would be fun to clean up the BMW and take it for a couple of test drives in order to see what was good and bad for my ad. Also it would be a good experiment to learn more about how trademe operates and since I got cleaned up selling a mates car at the Auctions last year I was all for trademe. To shorten the story; Everyone had no faith, I sold it in 3-4 weeks for what I thought was peanuts (poor market with recession, $10,300 for 1999 BMW 328 CI) and everyone congratulated me like a hero. Perhaps I should look at a career as a Used car salesman, one of the least respected jobs on the planet. Halloween. Good. Unfortunately no photos from the actual Halloween turned out as the bar was quite dark. 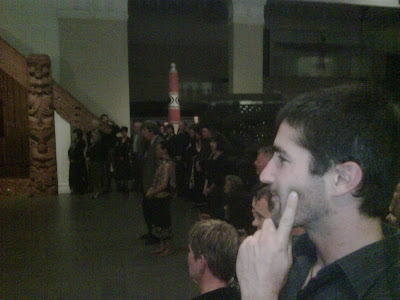 The night was good even though few dress up on Halloween in NZ, but every year it grows. 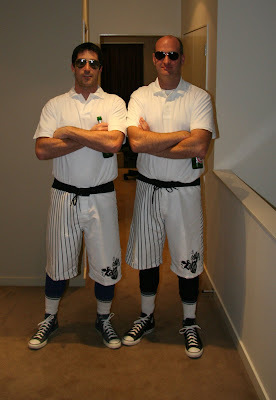 Ben and I went as Hans and Franz Van Schnitzel, Twin Tennis Stars from Luxembourg.